Greetings and happy Commencement Day! This semester, we have much for which to be grateful. Before you leave for the summer, I have some important updates to provide. The Board of Regents Committee on Community Colleges will consider campus naming in June, using private dollars. Last November, as CSN faced 15 percent budget cuts, the Board of Regents’ Committee on Community Colleges discussed a CSN campus naming policy but ultimately asked the college to further discuss the issue further and come back at a later date. I recently asked that an item be placed on the Committee’s June 2 agenda to reconsider campus naming. Since the committee last discussed this, there have been a lot of changes. Last week, the Bureau of Land Management’s local office provided its recommendation and request to the state director to issue the federal patent to CSN for the creation of the Northwest campus. As we go forward with planning, we need a name for this 40-acre location. CSN has established relationships with a number of North Las Vegas employers, including Faraday Futures, and a positive relationship with the City of North Las Vegas is critical to expanding our ability to partner with these new industries and better prepare our students to thrive in these fields. 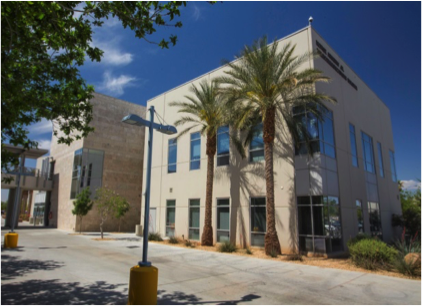 Finally, the City of North Las Vegas has stated that private funding could be secured to cover the costs of a sign change to the CSN North Las Vegas Campus. In two surveys, faculty, staff and students overwhelmingly expressed a desire to maintain the current campus names, and the majority did so because they said they did not want college funds diverted for this purpose. After months of studying the issue, our Institutional Advisory Council recommended the college include the municipality or neighborhood in its campus names to help CSN better connect with the distinct nature of each of our municipalities and better connect with existing and potential businesses that want to thrive in these cities. Therefore if private funds can be secured to change the name of the sign and the stationary, business cards and other branding can be phased over time, we can move this forward in the spirit of collaboration to address our shared interests of education, training and helping people obtain meaningful careers. As private funding can be secured, we can change the name of the Charleston campus as well if the Board of Regents supports moving in this direction. I have heard from a number of community leaders and businesses in North Las Vegas about their desire to have a North Las Vegas campus to help spread awareness of the College of Southern Nevada’s presence in that community and I will urge the board to consider this change. Three CSN Videography and Film students received a total of six student production Emmy Award nominations at the recent Pacific Southwest Emmy nomination party. This is outstanding news, and it marks the second consecutive year students were nominated for six Emmys. CSN students won five of the awards last year. The nominees are: Billy Ward, Dantae Carter, and Jeremy Hernandez. Congratulations to them all, and to our stellar Videography and Film Program. Respiratory Therapist of the Year! 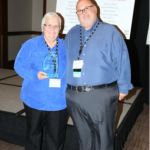 Cecilia Degenhart, CSN director of clinical education for the Cardiorespiratory Sciences Program, was recognized as Respiratory Therapist of the Year! Congratulations to Cecilia Degenhart, CSN director of clinical education for the Cardiorespiratory Sciences Program! 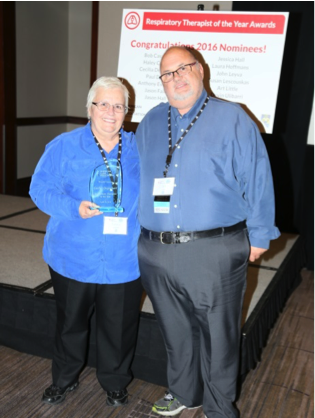 The American Lung Association and the Nevada Society for Respiratory Care recently named her Respiratory Therapist of the Year! Students celebrate after the 2015 CSN Commencement. This year’s event will take place tonight at 6 p.m. at the Thomas & Mack. 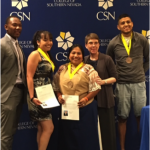 After a whirlwind week, including the terrific Outstanding Student Awards, the ASCSN Student Government Banquet and numerous pinning ceremonies, CSN will graduate its largest class ever tonight! Please make sure to come and support our graduating students. 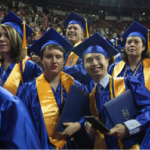 A record 3,508 students are eligible to receive 3,901 degrees and certificates, according to preliminary data. Official numbers for the spring 2016 semester will be available once final semester grades are in. 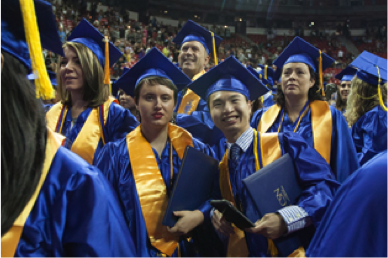 We’re thrilled to again see a record number of students earn their degrees and certificates. It shows us that the steps we have taken to guide students toward completion are helping. We are proud of the Class of 2016 and I look forward to celebrating them. CSN History Professor Dr. Sondra Cosgrove with graduates at the Native American commencement celebration last week. In addition to our 44th Commencement Ceremony on Monday, we have been holding a series of Multicultural Celebrations to recognize the achievements of the many CSN students from a variety of diverse backgrounds. These celebrations, put together by the Office of Community Relations, Diversity & Multicultural Affairs, were heavily attended. We consider them vital to recognizing and enhancing student success at CSN. Thanks to all who attended to support these terrific students! Just a reminder that open enrollment for fall begins May 21. Please encourage your family, friends and neighbors to enroll! Remember we are all ambassadors of CSN and I encourage you to talk to the community about our mission and how we serve our students. You can then refer potential applicants to www.csn.edu/MyCSN to apply or the Office of Recruitment, which can help new students navigate the application process. Many of you have asked about late registration going forward. CSN will continue to allow registration during the first week of the fall semester. We will study the data from this spring semester over the coming months to determine the most appropriate policy for our students going forward. 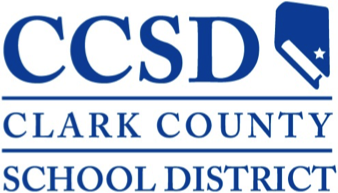 CSN and the Clark County School District have a remarkable partnership and an expanding array of programs, initiative and services that need support from various CSN offices. To provide clarity of roles and align the initiative with CSN counterparts, we are making the following changes effective May 15. Note: NACEP is the national accreditation for concurrent enrollment programs that CSN and CCSD are seeking. This change aligns programs service and support more naturally and more logically while affirming the positive relationships CSN needs to cultivate throughout the community. It distributes workloads better and should create pipelines for students to smoothly transition from CCSD to CSN and the collegiate experience. Effective July 1, two key functions–Financial Aid and Minority Male Mentoring–will transition from Academic Affairs to Student Affairs. Both functions naturally align with Student Affairs. As we work to scale up the minority male mentoring program and the change in services in Financial Aid, it’s appropriate to place both services in Student Affairs. The Financial Aid transition is on the eve of the annual auditing process that will require some phasing. This change will allow Academic Affairs to advance the academic master plan, and the assessment and program review functions that need greater attention. Starting May 20, CSN will require new students to use a CSN student email address as their preferred address. This will be the official means of communication for these students who apply on or after May 20 to attend the college. They will receive all official communications from the college at this address, in addition to their MyCSN Communications Center and however faculty members choose to connect with them in the classroom. All other students can continue to use their preferred external email addresses but should be encouraged to change their preferred address in MyCSN to their CSN student email. This will help CSN better communicate with students, whereas we are currently experiencing a number of complications due to the vast number of emails that CSN employees send to external providers. Please share with your students that they can access their student email address with their NSHE ID at http://studentmail.csn.edu/learnmore/. 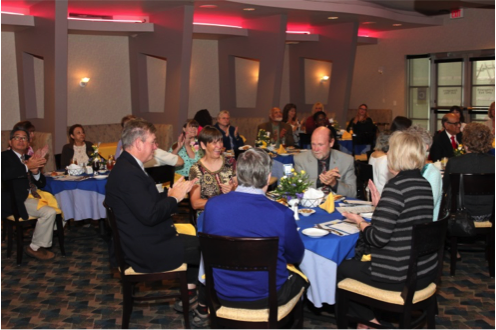 The CSN Retirement Luncheon took place this week, honoring more than 30 employees who will say farewell to CSN. 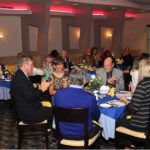 I had the honor of attending the annual retirement luncheon again this year. This is a bittersweet moment as we say farewell to colleagues and wish them well in their next adventures. This year, more than 30 people are retiring from CSN, representing approximately 568 years of service. This is a reminder to us all to acknowledge the many years of service and institutional knowledge of our faculty and staff. I hope these men and women who have dedicated so much of their lives to CSN stay in touch and involved in the CSN family. 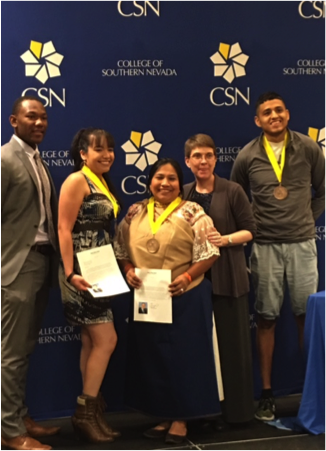 The College of Southern Nevada is recognized as a leader among community colleges in fostering student success. Exceptional Learning Environments which integrate career and liberal arts education, to shape well-rounded, engaged citizens, employees, and community leaders. Developing Solution-oriented Strategies to help students overcome barriers to educational access and success. A Culture of Accountability in which we balance data-informed decision making with flexibility and responsiveness to stakeholders, individuals, and events. A Collegial Work Environment that makes CSN the “employer of choice” for an exceptional workforce that is engaged in and accountable for the quality of CSN’s learning environment, and benefits from excellent support, growth opportunities, and competitive total compensation packages. Quality Community Partnerships that provide resources and educational opportunities to develop a skilled workforce. Cultural and Academic Initiatives that promote the advancement and appreciation of the arts, sciences, and humanities, contributing to the richness of our multicultural community. Environmental stewardship and public awareness of risks and opportunities for sustainability. Resource Development, Operational Efficiencies and State‐of‐the‐art Technology that supports an innovative and exemplary learning and working environment. Lifelong Learning: CSN values a broad-based education because a diverse foundation of knowledge empowers creative thinking, problem solving, and innovation. Excellence: CSN understands that achieving and surpassing our goals requires care, commitment, and quality, in teaching, learning, scholarship, service, and administration. Integrity: CSN places fairness, honesty, transparency, and trust at the center of all policies and operations. Inclusion: CSN embraces diversity because it heals social division and injustice, and promotes creativity, growth, and critical thinking through the integration of many different perspectives. Academic Freedom: CSN values freedom of thought and speech because open minds and uninhibited discussion are fundamental to teaching, learning, and responsible civic engagement. Connectedness: CSN builds a collective identity through shared governance, effective communication, and collaboration among students, faculty, staff, and community members. This has been an exciting semester and I certainly hope those of you who are off for the summer enjoy the time and rest. We will see you Monday, Aug. 22, for our Convocation Kickoff at the South Point Hotel & Casino. Look for more information about that event to come soon. This entry was posted in Monthly Chronicles and tagged campus naming, CCSD, commencement, email, emmy awards, enrollment, Graduation, respiratory therapy, strategic futures. Bookmark the permalink.